Originally created to provide additional capacity for the shipping public, The Talon Logistics Network has developed into a sophisticated Third-party logistics company. Talon is a one stop shop service for its customers of outsourced (or "third party") logistics services for part, or all of their supply chain management functions. The Talon Logistics Network specializes in warehousing and transportation services that can be scaled and customized to our customer’s needs based on market conditions and the demands and delivery service requirements for their products and materials. The Talon Logistics Network has expanded to include Talon Logistics, Talon Logistics Services, and Talon Warehouse Solutions. 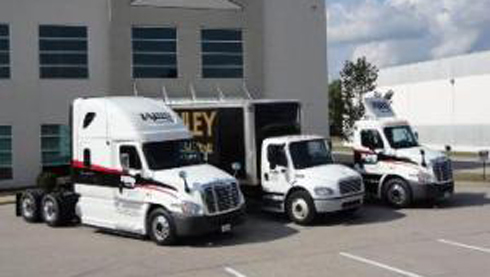 Talon Logistics has over 5,000 carriers and small fleet owners under contract to assist with your transportation needs on a moment's notice. Talon Logistics Services, our asset based trucking division, allows us flexibility in handling our customers' domestic van freight and international container movements. Talon Warehouse Solutions gives us the opportunity to handle all of your warehousing needs including short term warehousing, long term warehousing, trans-loading and fulfillment services. 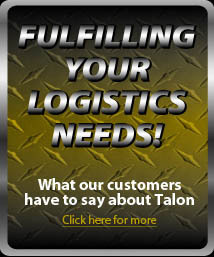 Read How Talon Logistics is Growing!